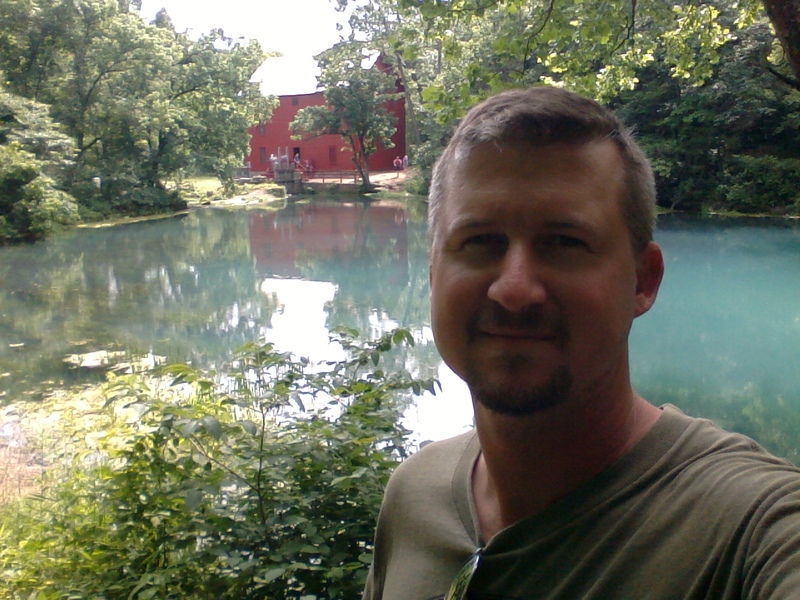 If you have only been to ONE place in the Ozark National Scenic Riverways, it is very likely Alley Spring and Mill. 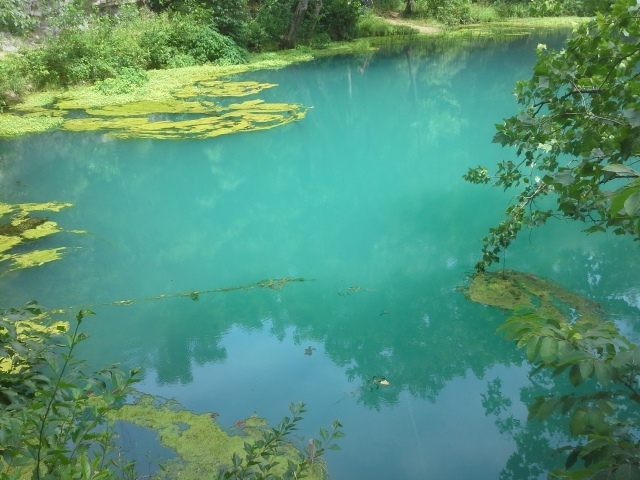 The chilly blue-green water coming to the surface of the earth, guarded by the stoic and impressive Alley Mill next to it, flows rapidly down the spring branch and off into the Jacks Fork River. This location is probably the most visited spot in the ONSR, and for good reason. The history of the mill and the surrounding area, centered on this lively spring, captures the story of the industriousness and determined heart of the people who lived in this area over a hundred years ago, and the community that came from their hard work and thoughtful use of the natural resources at hand. 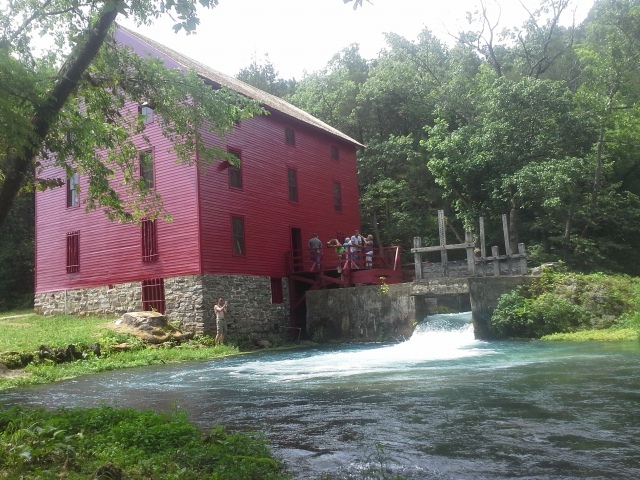 We were lucky enough to visit this past July, right after the mill had been reopened after a recent face lift, and as always when I have been in these parts, it was a wonderful and enlightening experience. Welcome to Alley, Missouri. From the intersection of 19 and 106, take 106 West for about 6 miles, cross the bridge over the Jacks Fork River, and make a right into the parking lot. Above the parking lot is a picnic pavilion and bathrooms. Follow the sidewalk away from the parking lot on the north end. This will take you past the one room Story Creek School, and on your right will be a bridge that crosses over a backwater slough. Cross the bridge, and before you will be Alley Mill. Just beyond the mill lies Alley Spring. Alley Spring has an average daily flow of 81 million gallons of water and is considered to be Missouri’s 7th largest spring. Its chilly discharge tumbles and winds through the trees and rocks, into a central channel, and eventually into the lively Jacks Fork River. 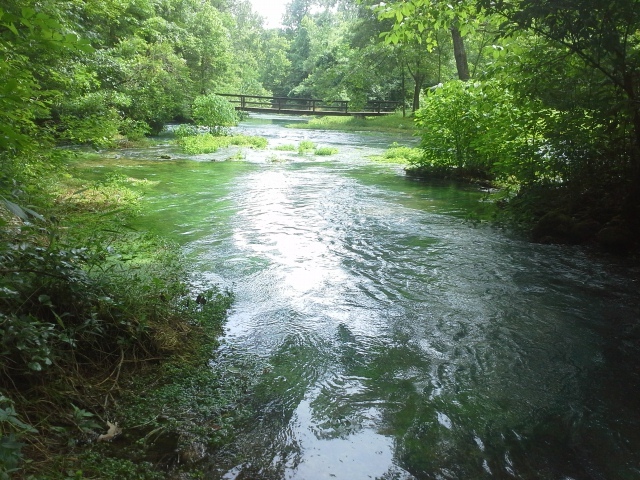 Of all the springs that I have been blessed to visit in the Ozark National Scenic Riverways, this one, along with its spring branch, is probably the prettiest and most picturesque. The community of Alley originally had a different name, but when a request was put in to the United States Postal Service to have an office there, they went with the name of one of the more prominent farmers in the area, John Alley. The town that had been established is an example of why people chose to live their lives in places like this. The water flowing from Alley Spring offered not only the life giving, thirst quenching solution to field work on a farmer’s miserably hot summer day, along with all the other people in the community, but it also allowed for the ingenuity of the residents there to create mechanisms that could simplify, relatively, the day to day labor that had to be done in order to live. Alley Mill was the focal point of a community that brought its grain from the fields to be milled in order to make the breads and cereals that sustained the lives of these hardworking Ozark homesteaders. Drawn to the rivers, harnessing the power of the water, and using it to their advantage mechanically, is how many communities across our country were started and maintained. Some towns, though probably not reliant on a mill anymore, that I’m sure still exist to this day. Alley Mill is an impressive structure. Tall, solid, monolithic, and brilliantly red, one might never suspect that a spring exists just behind it. People who visit this area are drawn to it, as they have been throughout its history, only these days we visit it to learn about our cultural roots and to take a glimpse at how things used to be for the people of Alley, Missouri over a hundred years ago. 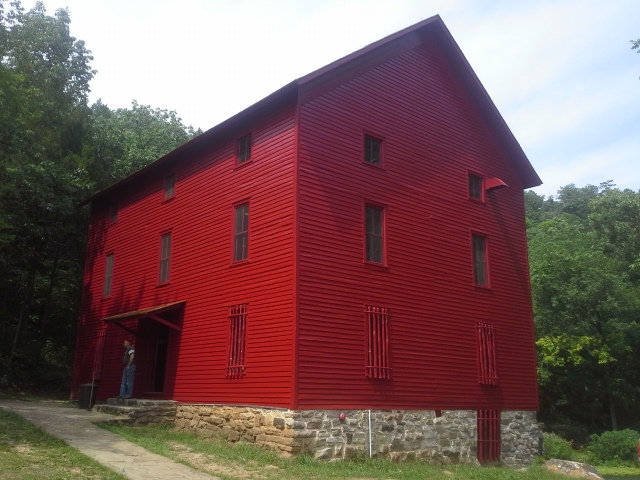 Completed in 1894 by George McCaskill, it was a “Wheel-less” mill. It used a turbine system, with belts and a drive shaft almost as long as the building, and was relatively modern as water wheel mills where old fashioned at that point in history. The turbine system allowed the millers to control the speed of the machinery, changing it to better suit conditions, instead of relying on the movement of the water to dictate what speed everything happened at. It was the center of the community until 1925 when the property was sold to the Missouri State Park system. 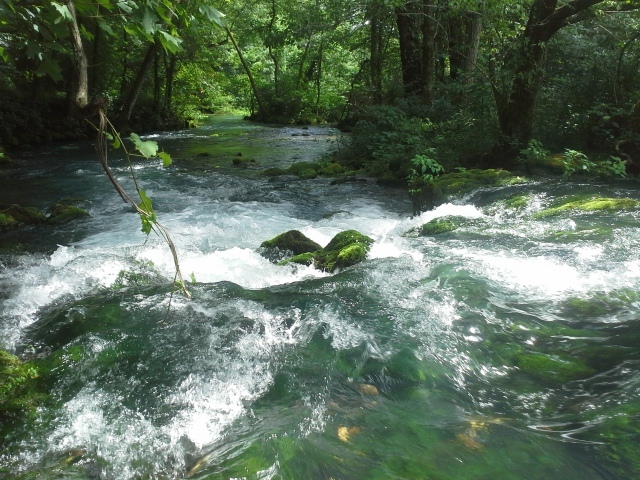 With its natural beauty and historical significance, it was put on the big stage as part of a National Park when the Ozark National Scenic Riverways was established and dedicated in 1972. It is the most photographed mill in the Ozarks, and I would bet that it is in the top ten of photographed places in all of Missouri. As with all springs, due to their nature of being unique and precious ecosystems, please refrain from swimming, fishing, wading, or generally disrupting them in any way. They tend to be home to plants and animals that are sometimes not found in most other places, and as custodians of the forest, we need to give them the respect and care that they deserve. Keep your toes on dry land. The Confluence. Alley Spring branch on the left. Jacks Fork on the right. One trip where I had visited, when there were just a few other people around in the late morning on a day with impending rain, we spied a couple of snakes along the spring branch, very likely looking for their lunch. Be aware, as with all healthy waterways, that you will possibly run into some of the creatures that live in the area. Watch your step and appreciate the chances you get to see animals doing their thing out in nature. 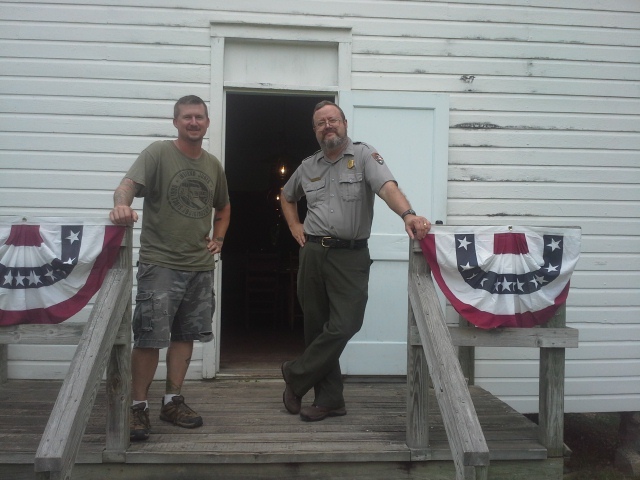 Me, along with one of the coolest people I have the pleasure of knowing, National Park Service Ranger Bill O’Donnell, on the steps of the relocated Storys Creek School. 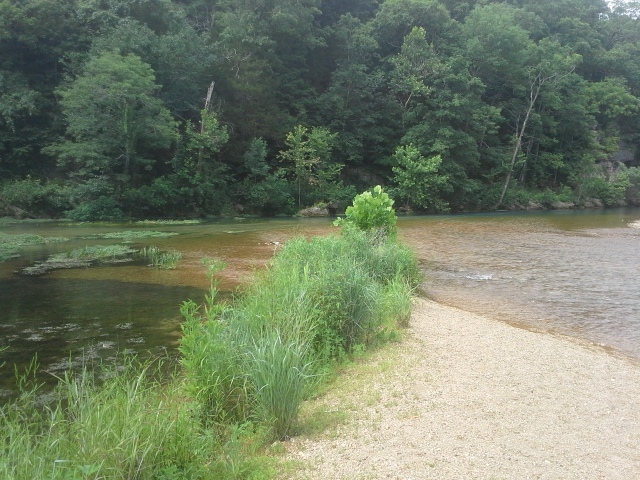 I love the Ozark National Scenic Riverways. I cannot deny it, and I will tell anyone who will listen of the beauty and history of that region of Missouri (what little I actually do know) given the chance. 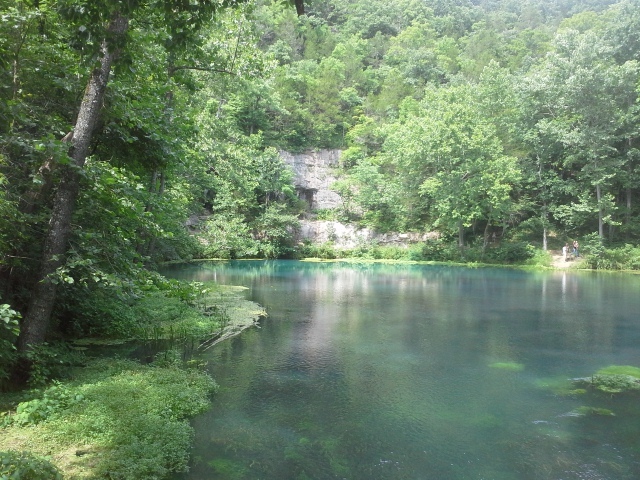 Alley Mill and Alley Spring are some of its most vibrant jewels, and they are at the center of a place where we can directly see our connection through history to these natural wonders in the rugged mountains of the Ozark region. One day I will seriously consider moving there as my own history progresses, and the children branch out from under my roof and find homes of their own. I look forward to that day when maybe I will be sitting on the porch of my own cabin, possibly near a creek that runs into one of the beautiful, crystal clear rivers there, with images in my mind of what it must have been like to live down by the mill in the spring valley, along the banks of the Jacks Fork River, in Alley, Missouri. Thank YOU, Carole! Have you been there? The more and more that I find out about the history of these places, the more fascinating I find them. No, I sure haven’t. I will have to check those out, thank you! « Where can I go camping in Missouri?